Let's unwrap that prayer and see if you don't see what I'm trying to say. There's really only one thing right with that prayer. It's when we say, "Lord." God is Lord over everything, so when we say "...we want to give You...", that doesn't work because everything is already His. portion of everything that we own. Either way, the attitude behind this sincere and holy sounding prayer really concerns me: those who believe myth number five essentially say, "Here's a little bit, God, but I'm keeping everything else for myself." It almost sounds like God is supposed to be really appreciative that He got anything at all. 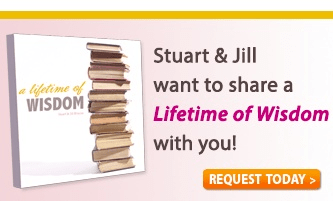 Stuart and Jill Briscoe want to share A Lifetime of Wisdom with you! This 3-message CD series shares thought-provoking teaching from Stuart and Jill that shows how your life’s experiences can lead to greater spiritual wisdom.